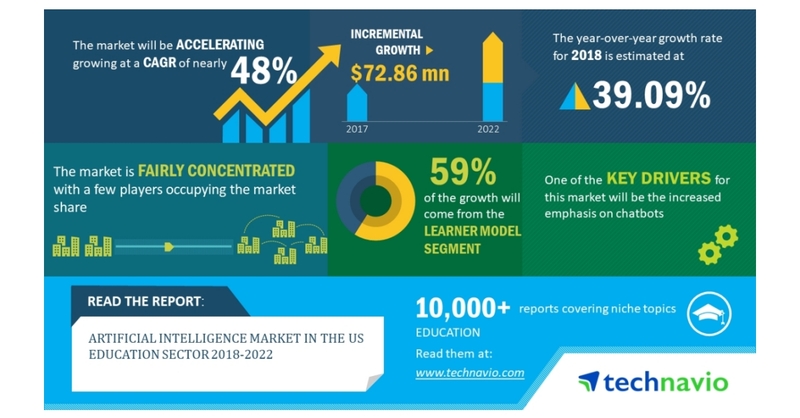 LONDON–(BUSINESS WIRE)–According to the market research report released by Technavio, the artificial intelligence market in the US education sector is expected to accelerate at a CAGR of almost 48% during the forecast period. The significant scope of AI applications is one of the key factors triggering the growth of the market. This research report titled ‘Artificial Intelligence Market in the US Education Sector 2018-2022’ provides an in-depth analysis of the market in terms of revenue and emerging market trends. It also includes an up-to-date analysis and forecasts for various market segments and all geographical regions. In 2017, the learner model segment accounted for the largest share of over 59% in the artificial intelligence market in the US education sector, followed by the pedagogical model and the domain model. Increased emphasis on chatbots is an emerging trend in this market space. In the US, schools and colleges are increasingly emphasizing on the use of chatbots. Chatbots use AI, ML, and deep learning technologies, to store, process, and communicate data to students. Chatbots have the capability of performing multiple functions, including conversations with students and answering queries. They can perform diverse set of tasks and can also be used to assess, and correct assessments submitted by students. As the scope of chatbots is increasing, research on the applicability of chatbots is creating new opportunities for vendors.